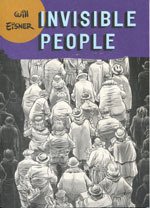 Invisible People tells the story of three ordinary individuals adrift in the city. The characters who inhabit these tales each value their privacy; their lives are lived alone, withour engaging in the outside world. And yet each reach a turning point, when the individual experience goes from the anonymous to the universal, embodying some of the great themes of human existence: love, loss, loneliness, and even the power of religion.